Road casualties have become regular news. The number count is increasing in number. Though not all but many of them are leading to fatal injuries and even the death of the passengers. Let us go through the following statistics to understand the rise in the graph. • 324 billion vehicle miles Total motor traffic. ● Between 2015 and 2016, motor traffic levels increased by 2.2%. ➔ In North West, there has been 186 number of Fatalities. ➔ West Midlands witnessed 155 number of fatalities. ➔ South East witnessed 280 numbers of Fatalities. 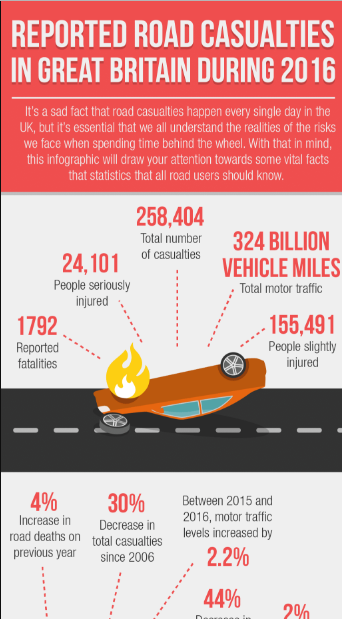 This infographic by Driver Knowledge gives you a detailed report on road casualties in Great Britain during 2016.